Steve Doocy Advances Meme That Occupy Supporting Students Indoctrinated - Oh, The Irony! As I reported in an earlier thread, the right wing world went all apocalyptic over the "Occupy" supporting song written byVirginia third graders. Alleged Fox "news" anchor, Martha MacCallum just couldn't believe that children would do such a librul/commie/ pinko thing. And not surprisingly, "the morning happy-talk show that Ailes uses as one of his primary vehicles to inject his venom into the media bloodstream," otherwise known as "Fox & Friends" seized the issue in order to promote their ongoing propaganda about how the librul/commie/pinko school system is trying to turn our precious innocents into raging Marxists by creating "class warfare." Last Thursday, Fox & Friends wall of genius, otherwise known as Steve Doocy, reported on this travesty as part of their ongoing series, "The Trouble with Schools" which is essentially right wing propaganda that feeds the Fox News meme of how the librul/commie/pinko public school system is creating tiny Trotskeys. Monday morning, 6:50am, #2 pencil in hand, a clean scratchpad, and fully prepared for Brad Stine’s weekly appearance on Fox and Friends. However, I was not prepared for Stine’s new haircut. Clearly his greasy meth tweeker look wasn’t working for him. But that’s no excuse to go to an ersatz Frank Luntz look, right on down to the bad toupee. That is a bad toupee, isn’t it? No matter because, as discussed previously, there is no topic on Fox “News” on which Brad Stine is not a maven. This week he dragged out to discuss bail being granted to a burglar in which his cohort was shot dead by the home owner. Which means that among all the other things on which he’s proved himself to be an authority, Stine must also be an expert on the Judicial System. Fox News: John 3:16 or 666? Glory Hallelujah! Last night, Broncos quarterback Tim Tebow not only threw 316 yards to bring his team to glory over the Steelers, he also set a post-season record by averaging 31.6 yards per completion. According to God’s Messengers at FoxNews.com, and at Fox News Channel as heard by moi this morning on Fox and Friends and America’s Newsroom, it’s (probably) a miracle! Some people say it’s the hand of God Himself pointing us to the message of John 3:16! But wait! Are there other, more sinister numbers lurking in the shadows at Fox? There seems to be a Fox News meme here. Much as Fox loves to attack the Occupy movement and accuse Democrats of playing “class warfare,” at the same time, the network is trying to co-opt the populism and use class warfare against President Obama. You may recall Fox’s attack on President Obama’s Martha’s Vineyard vacation last summer. More recently, the network went after his Hawaiian vacation over Christmas and New Year’s. Yesterday, Fox News Sunday tried to equate Mitt Romney’s role as a venture capitalist/corporate raider to Obama’s role in the Solyndra bankruptcy But, in a twist that could have been engineered by (Fox News contributor) Karl Rove, Fox has taken that a step further by helping 1%-er Romney make Obama’s “elitism” a campaign issue. Posted on Fox News.com this morning and still a second tier lede. 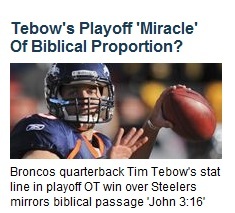 Seems that Tebow's 316 yards matches his favorite bible quote, John 3:16, about God giving the world his only son. OMG, that proves it. Tim Tebow is God's other son! Seriously, do people actually believe this - uh - stuff? Martha MacCallum Says "Occupy" Supporting Third Graders Brainwashed? In the cloud cukoo land of right wing Merkins, our children are being constantly bombarded by satanic, socialist, atheist propaganda which seeks to teach children that the USA is not the most awesome country that Jesus ever created. According to these true Merkins, librul education is actually deluding our precious innocents into thinking that hard work doesn't always reap its own rewards and that the captains of industry aren't benevolent father figures but corporatists who don't give a crap about anything other than record breaking profits. Income inequality, according to residents of the state of right wing delusions, is merely left wing indoctrination meant to create "class warfare" on the part of those who, regardless of their declining economic situations, should be grateful to live in "exceptional" Merka. And that's why, when some Virginia third grade students composed a song about the "99%," the right wing shills for the 1% went apoplectic about how this was "class warfare." Not surprisingly, Fox "News" provided some validation. On Fox News Sunday today, host Chris Wallace may have thought he was playing the tough but fair host by repeatedly interrupting DNC Chairwoman Debbie Wasserman Schultz as she attempted to answer his question about why Democrats are attacking Mitt Romney. But a closer look at his behavior strongly suggests his real purpose was to discredit attacks on Romney’s history as a venture capitalist - via the ridiculous comparison to President Obama’s role in the Solyndra bankruptcy. Brian Kilmeade Scolds Tebow Mocking Football Player Who "Mocks God"
If the early Christians were as humorless as those members of the Fox News church of perpetual outrage, it's no wonder that they had some hard times. Today's martyrs are constantly whining about how they get no respect from the forces of satanic secularism. But if they want some insight into why they are lampooned, they need only to click their remotes to Fox News to see their fellow Jesus BFF, Brian Kilmeade, a high priest in the Fox Tim Tebow cult, make idiotic comments revealing his devotion to God and Tim Tebow (who, on Fox, is God). Kilmeade's latest pearl of wisdom involves statements from a football player who is obviously heading for a quick dunk in the Lake of Fire after blasphemous comments directed towards God and Tim Tebow who, on Fox, is a deity. And Brian is pissed - the same Brian Kilmeade who had to apologize for an anti-Islamic comment (only one of many). But he has God's and Tebow's back so it's all good.